Thanks to the power of the internet, creating a business online is now easier than ever. Not only is it easier but it’s also extremely cost effective. Gone are the days when you have to scope out a new location to start a retail based store that only allows you to target your local audience. You can also throw out the frustrations of starting every month in the negative thanks to thousands of upfront costs going towards employees, rental costs, insurance, holding product and much more. Now anyone can start a legitimate brand or business on the internet with just a few dollars. All you need is a domain name, a web hosting account and a simple wordpress installation. Total cost… roughly $100 per year. However, just coming up with the idea for a brand or business online isn’t enough. Now you need to focus your efforts on creating something of value and that people can trust. Let’s take my personal brand for example and how it’s progressed over the years. I first started making money online back in 95. Over the next ten years I would focus my efforts on everything from affiliate marketing, site building and email marketing. In 2007 I decided to launch my own personal brand and blog at ZacJohnson.com. This gave me the ability to now focus on my own brand and business, which allowed me to focus less on making other businesses money and growing out their own base of customers. Since the launch of my blog in 2007, my personal brand and opportunities have just exploded. The key take away here is that you must transition your brand and business at all time. During that time period of 1995-2007 I was always adjusting my business for what was next. Email marketing was big back in the day and much cheaper/cost effective than it is today… and now the social networking and mobile market are hot. It’s not just about transitioning your business with your environment and industry, but also adapting with your audience and how they are viewing your content and receiving your message as well. Back in the 90s when I was focusing on content generation and affiliate marketing, I was building static HTML sites that would rank well in the search results. Before that I was pushing web hosting in AOL chat room forums. This was way before social networks or wordpress was around. Jump forward to where we are today and less people are using email and no one is using chat rooms. Instead people are using wordpress blogs, social networks and podcasting to deliver their message and increase user engagement. Again… it’s all about keeping the core of your business the same, but adapting it to your audience and how they want to receive your message. With all of this in mind, this leads to my latest transition for my personal brand and business… which is now podcasting. Making the leap from blogging to podcasting is not easy and they are two totally different beats. But it’s a change that is necessary. 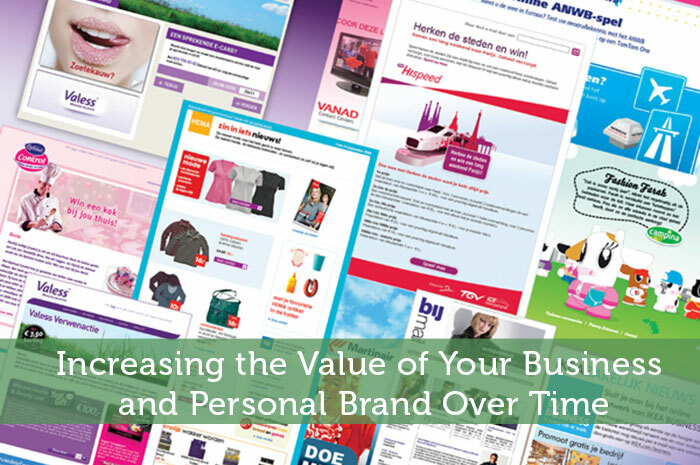 Is Your Business and Brand Value Progressing Ahead? This one just one example of my own personal business and brand, and how it’s transformed over time. If I were still focused on HTML pages and trying to use AOL chat rooms, my business would never have made it to where it is today. Don’t be afraid to change your business for the better by trying new things. Ask your audience and customers what they want and gain their attention and loyalty. The world of business is no longer static and constant. For every time your business decides to stand still, your competition moves two steps forward. Zac Johnson is a online marketer with over 18 years of experience. You can view my blogs at ZacJohnson.com along with Blogging.org. Absolutely, if you want to continue to be successful, you need to constantly adapt to changes. Just look at the evolution of phones in the past twenty years! Anyone in America can be a millionaire if they put in enough time and have the ambition to succeed. Do not let life sell you short. It’s crazy how much everything changes in such a short amount of time, but the product of writing is still the same. Refined article, which shows best possible ways to grow business that too in cost effective manner, where every effort, right from branding to satisfying customers with product. Also changing its plans with time & adapting new concept can be useful & better for business.